Take a slow cooker (we used a 6-quart slow cooker) and spray the inside of it with cooking spray. In a small container, mix together the chili powder, cumin, salt and cayenne pepper. Take the spice mixture and rub it all over the roast. Take the onion and garlic and place it in the bottom of the slow cooker. Place the meat on top of the onion and garlic. 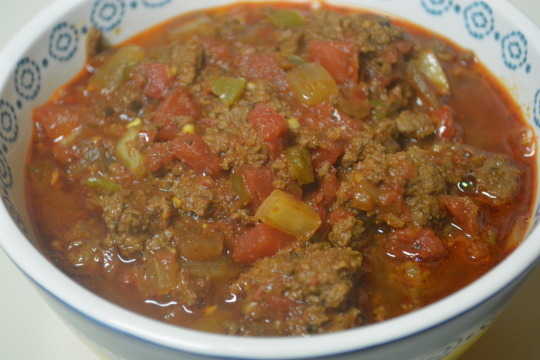 Spoon ½ cup of the salsa over the meat, putting the lid on the slow cooker afterwards. Let it cook on LOW for 8 to 9 hours or on HIGH for 3 ½ to 4 ½ hours on HIGH or until the meat’s very tender (we cooked ours on LOW). Take the meat out of the slow cooker and place it on a plate. Shred the meat using two forks. Skim off and throw away any fat from the juices you can, placing the meat back in the slow cooker afterwards, mixing well. 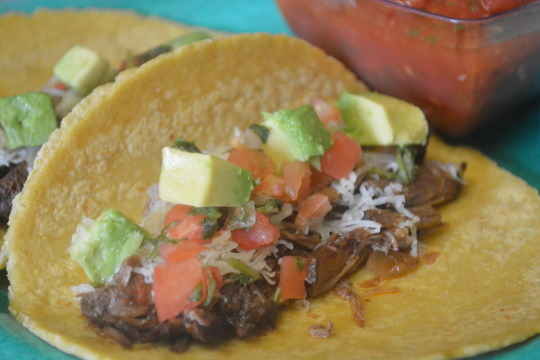 Place the meat on the warmed tortillas, topping the meat with the cheese, tomato, cilantro and avocado. 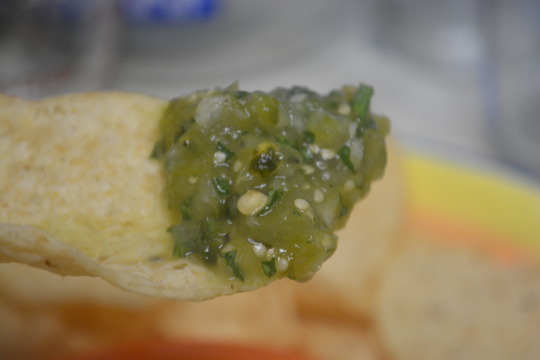 Fold it up to wrap** and serve with the remaining salsa. *We decided to use some pico de gallo instead. **It’s easier to eat this like a taco instead of a wrap. Maybe if the tortillas had been bigger we would’ve done wraps. They called this a wrap but we call it delicious no matter how you eat it ! Even though we increased the cayenne, the other flavors still came through in the meat. 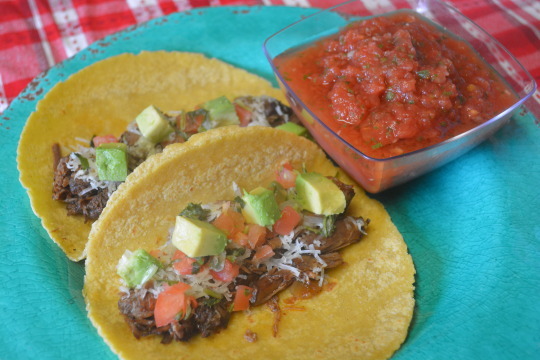 The pico de gallo brought a freshness to the dish and the avocado added a nice creamy goodness. The salsa is already delicious all on its own so naturally it only made the wrap taste even better ! Take a medium-sized bowl and add the black beans to it, mashing it with a fork (we mashed them until they looked like refried beans). Mix in ½ cup cilantro and the following ingredients: cheese, panko, ground cumin, dried oregano, sea salt, chopped jalapeño and egg whites. Take a baking sheet and line it with aluminum foil, spraying the foil with cooking spray afterwards. 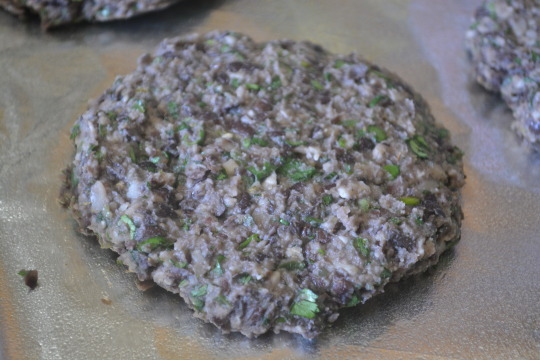 Shape the bean mixture into 6 (½-inch thick) patties. Place the patties on the lined baking sheet, sticking the sheet in the oven afterwards for 20 minutes, carefully flipping the patties halfway through. 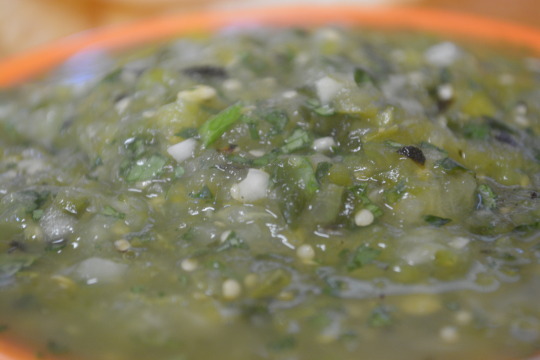 Take another medium-sized bowl and mix the following ingredients together in it: the remaining cilantro, mango, shallots, lime juice, avocado and minced garlic. 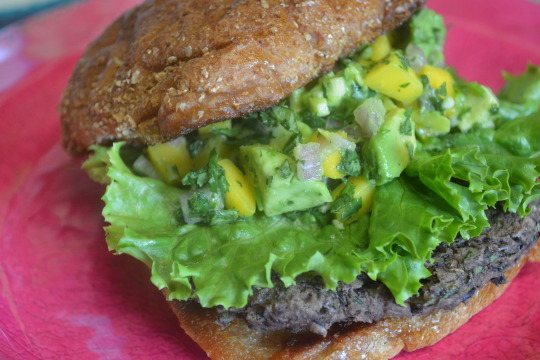 Take each patty and place it on a bottom bun, topping each one with a lettuce leaf and 1/3 cup of mango salsa, placing the top bun on afterwards. We loved this burger ! The patty itself has a little bit of heat to it. It’s tastiest when you can get the mango salsa in a bite with the patty. The lettuce is a nice touch (although we do wonder if they simply called for lettuce to help keep the mango salsa from spilling everywhere). The whole burger, toppings and all, is a great example of how tasty veggie burgers can be. We weren’t paid in any form to promote Bush’s or Cooking Light. Take a medium-sized saucepan out and pour the oil in, setting the heat to medium-high. Once the oil’s hot, add in the onion, garlic, ancho chile pepper and the salt. Stir constantly for 2 minutes before adding in the rice, continuing to stir for an additional minute. Add in the broth, Roasted Salsa Roja, and the water. Bring the dish to a boil, turning the heat down afterwards so it’s at a simmer. Put the lid on the saucepan and simmer for 20 minutes or until the rice is tender. Take the saucepan off the heat, taking the lid off afterwards. Cover the top with a clean kitchen towel and put the lid back on afterwards. Don’t mess with the saucepan at all for 5 minutes so the towel can absorb any excess moisture. 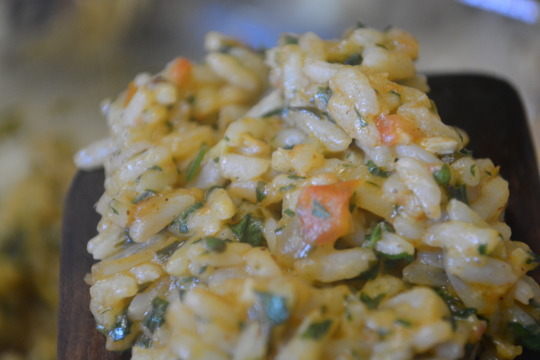 Take the towel and lid off and add the cilantro into the rice, using a fork to mix everything together and help fluff the rice. When we first took a bite of this, honestly we thought it was bland but when we added a little extra salt, it really brought the flavors out. We kept coming back to nibble on it before dinner, because it was just that good !